Cooling House’s loop thermosyphon Cooling Solution is a closed-loop, phase change heat transfer, passive heat capture product that can move several hundred to thousand Watts up to meters away from the heat source (evaporator chamber). 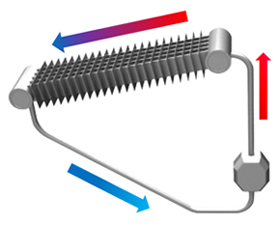 Within the chamber, working fluid is boils and generate a pressure difference, moving the working fluid and heat in a closed loop to a highly efficient condenser, as shown below. The entire system may be configured into different form factor required by the designer, and uses minimal internal space due to the extremely high efficient 2 phase-flow heat transfer. The system is sealed, reliable, and predictable in its behavior. Loop thermosyphon functions with gravity, with customized design our solution can function in multi-orientations.